Bring plenty of hankies for the shiny new play opening City Theatre's 34th season, Long Story Short, by Brendan Milburn and Valerie Vigoda. No cheap tearjerker, this world-premiere musical romance is truly touching, i.e., touching the audience with merriment and passion as well as pain. And if it seems a little emotionally manipulative -- well, catharsis is the basis of all good drama. A vision of a long-term relationship, Long Story Short (based on David Schulner's 2001 non-musical An Infinite Ache) is a two-person show set entirely in a bedroom with a gorgeous antique bed. Sounds familiar? But it goes well beyond being a postmodern version of I Do! I Do!/The Fourposter, the portrayals of a 50-year marriage from the turn of the last century (respectively, a 1966 musical and the "straight" original from 1951). Far from those upper-crust, uptight WASPs portraying the past, Long/Ache's characters are less generic and more realistic. 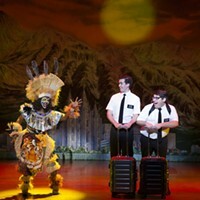 And the play has no hang-ups about using theatrical gimmicks to suggest the passing of time. "It moves differently here," says the program of the plays' "time." The focus is on the ups and downs of two complex people before, after and during marriage: Charles, a Jewish newcomer to Los Angeles, and Hope, an Asian-American California native. Their journeys into middle age and senior status are only barely suggested (no overdone makeup here) as their love grows, fades, is tested and re-tested with extraordinary as well as ordinary vicissitudes of married life. We know these people, and like them. 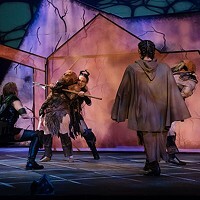 The songs (composer Milburn) blend various strains of pop and theater tradition with clever and sometimes sassy lyrics (written by Vigoda) to delineate character and enrich the storyline. (The music is played live by a four-piece ensemble.) Both charming and credible, Ben Evans and Pearl Sun give seamless performances as actors, singers and dancers, from the adventurous "Live Like This" to the stormy "Knock Down/Drag Out" through the comic "Empowered" into the wistfulness of old age. Commissioned by City Theatre, Long Story Short makes a good addition to the modern theater repertory. This production, directed by Tracy Brigden (City artistic director) and produced with TheatreWorks (the Palo Alto, Calif.-based company where the show plays in December), is a must-see for anyone who loves theater, loves music and loves love. 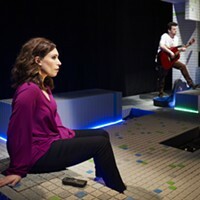 In tune: Pearl Sun (left) and Ben Evans in City Theatre's Long Story Short.